MyGroupNI is an eGovernment digital inclusion initiative designed to bring together the public, voluntary, community and private sectors. Exploiting Northern Ireland's lead in broadband availability MyGroupNI is expected to have an immediate impact on the lives of over 25,000 residents, who previously have had little or no exposure to the Internet or eGovernment environment. The aim of My Group NI is to digitally include organizations, that would ordinarily deem it too costly or challenging to maintain a website, to join in the digital movement by taking ownership of their own individual, sophisticated and unique web portal. These web Portals are ideal for community based umbrella groups who have sub groups attached to them, these can range from sports clubs to community groups providing they are non profit making organizations. Any umbrella group that signs up to the MyGroupNI initiative will not only be provided with a state of the art website that can be easily updated and maintained by a dedicated administrator but will also act as an individual portal for all of their subgroups thus allowing all of these groups to feature in their directory. Unlike most other portals that only allow subgroups to have one page of static information, the MyGroup portals offer each and every subgroup their own ‘mini’ website within the organizations website. By linking communities together through web portals it eliminates the fragmentation of sub groups and umbrella groups that exists online at present. Everything in a sense will be under one roof, for example if you want to find out anything about Young Farmers Clubs of Ulster, whether it is information about an individual club or general information about YFCU you simple make one stop to the YFCU portal site and all the information is there, there is no need to come out of this website to find a club website, it will conveniently be in the directory. This theory can be applied to all umbrella organizations and will by far enhance the opportunities that regular websites offer. 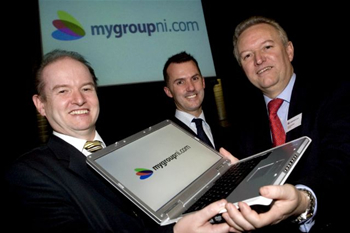 MyGroupNI is still in the pilot stage of the initiative but with clients from high profile organizations already onboard the success so far has surpassed expectations. If you would like further information about MyGroup or would like to register your organization please Click here.